When you send data from the master to the slaves, do all the slaves receive the data perfectly? Are you switching between the slaves properly using SS’? Have you made the right connections? Can you share the code that you tried to implement so that we can look into it and help you out if we could? To share the code, go to pastebin.com, paste your code there (use ‘C’ for syntax highlighting), and then share the link here. sorry for my late reply…i was trying but could not access to this websites for couple of hours…yes when i send the data from master to slaves all slaves receive data perfectly and one of the slave also transmitting data perfectly. but i think switching is the problem..but i cant figure it out. i have used atmega32 for master and atmega16 for each slaves.. So what’s your problem? Please give us some more information! Thanks! thanks a lot for your helpful tutorials. because SPIF flag is set when transmission completed ! but your code said that : transmission completed when SPIF flag is clear(0). My bad.. I am sorry. The SPIF is set after the transmission/reception is complete. SPIF flag is set when transmission is completed. While(x) remains in loop as long as x is not zero. Using while(SPSR&(1<<SPIF)) would be zero and it would exit on first check. With while(! (SPSR&(1<<SPIF))) it's 1 as long as SPIF is zero and turns 0 when SPIF is set and transmission is completed, thus quiting the loop. Thanks for another great tutorial. I have learned a lot here. I am currently working on a project where I need to send multiple bytes in one transmission. I am wondering if you can point me in the direction of resources where I might learn to accomplish this? Do you want to transmit multiple bytes of data together (at the same time)? That would be kind of parallel communication. Or do you want multiple bytes to be sent one by one without breaking the transmission? In that case, you could perhaps use I2C, wherein in between start and stop sequences, you can transmit any number of bytes one by one. Thank you for responding to my question. I apologize, I should have read further into the datasheet of the device I am trying to communicate with before I started asking questions. The devices’ manufacturer has header files to use in conjunction with developing the app that utilizes the device (VM800B display module made by FTDI, if you are curious). I believe these header files handle the transfer of Bytes to the device. I just have to figure out how to set up the API so the software knows how to access the SPI of my AVR (ATmega 328) The example application code from FTDI is developed for arduino, of which I really know nothing about, so I will have to figure out how to translate it for an AVR in Studio 6.1 . Any advice or suggestions on how I might quickly learn how to accomplish this would be greatly appreciated. Thank you. Great guide! Easy to read and understand. Cant wait to hook up my OLED and start writing some code. hello Mayank! very good explanation there! i have pic18f45k22 and the transciever i am using is nRF24L01 for both MCU. one PIC is as a TX and other one as RX. i want to send data over RF but i dont know where to write the data in the program. i have the program code. the RF is working well such that when the TX is switch on, then the LED on the RX site lights up. when TX is disconnected the LED on RX gone. i just want to add up simple program like when i press button on the TX site, the LED on the RX will light up.. can u guide me please sir.. any help is much appreciated! Before interfacing the RF modules, did you try to send and receive data over the SPI correctly? You’ll need to send the data from inside the while(1) loop like the one shown in the example above. Yes you are correct, The MOSI goes to MOSI and the MISO goes to MISO. For more information regarding connections between two AVR Micro-controllers using SPI please see this. Yes you can. Computers can store only integers. In order for them to store floating point numbers, they need to convert it to integer. So ideally, whenever you store a float, it is actually a 32 bit integer data. You should be able to send this data directly through SPI. At the receiver’s end, make sure you read it into a float variable, and the rest is taken care of by the compiler. Read this and this about representing floats in memory. but it is possible to send multiple data by the SPI port? I was wondering though, if i don’t have a slave device to connect it to the micro-controller(master) can i connect the MOSI (of the master) to send data and the MISO pin (of the master again) to receive these data? In simple words, connect the MOSI pin to the MISO pin of the micro-controller like the USART topology loop-back test (Tx to Rx ) ? Theoretically, yes, it’s possible. Try it out. You haven’t included any delays. Try that out. I am a bit confused about how you control the slave. This is what they mean by no automatic control. You’ll need to explicitly specify in the software which device you’re talking to. Does that sound good to you? That is what I was looking for. My concern was that I couldn’t find it in the example master code or slave code, and that’s what caused the confusion. MAX Sir, Pleas show a tutorial for writing and burning program on 8051 or AT89c51 micro-controllers. Sorry, but out focus is not on 8051. 8051 is an outdated and obsolete microcontroller anyways. but what about Atmel’s AT89C51 micro-controllers. Great job! I’d like to use the slave device (i.e. sensor, temperature sensor, etc) to send data to the master. What would be different with the code? Nothing much. Just go for it! Really? Which code is it? I can’t find it anywhere. Max, your tutorials are awesome!! Good work. Well explained and of great basic knowledge. 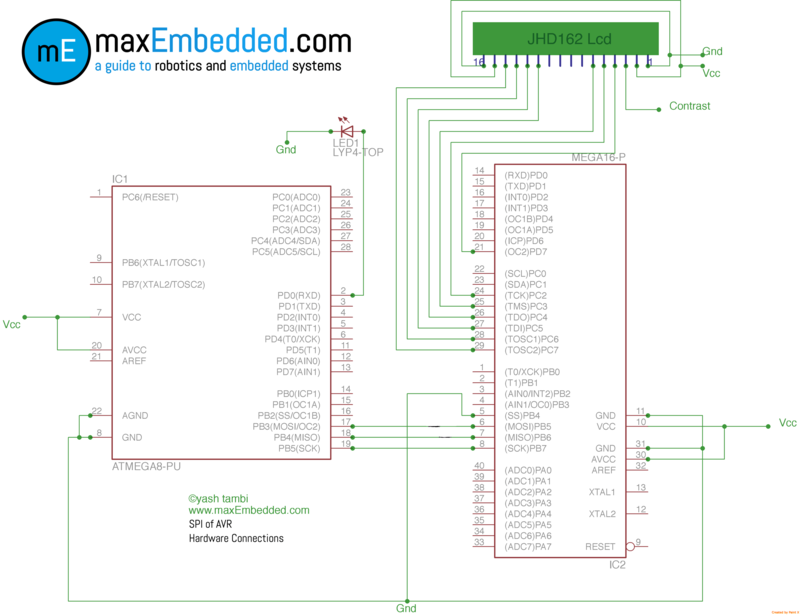 I think there has been a mistake in your harware connections diagram where the atmega 8 SPI pins are connected in a misleading manner to the slave atmega16. I am notifying this because i tested the hardware connections and it seems to work only if you connect MOSI to MOSI and MISO to MISO. Yes, thank you! Really appreciate that. Someone else brought this to our notice earlier as well, but we forgot about it. Thank you, we’ll add it to our to-do fixes list. I need C code to send data to LCD using SPI communication, atmega 128 ? Any idea ? Open up the datasheet of the LCD and read through it! Ist I would like to thanks for this post, is too good. I already read SPI, but after reading your post, got something new with clear some doubts as well. I’m little bit confused, as I interfaced MAX7221 with ATmega32 (SPI mode), I need of SS’ pin to interface with slave device and configured in my programming as well. Now question is this, here in your sample code (ATmega8_Master, ATmega16 & LCD_Slave), why didn’t we use this pin LOW & HIGH for data transfer as I used SS’ LOW & HIGH with MAx7221. Basically, when you have only one slave to interface with the master, you never really have to select a slave. There is only one slave, always. So, by grounding the SS’ pin on the slave by hard-wiring it to ground in such a setup means that that slave will always be selected, and that is okay since there is no other slave that we might want to select at any other point of time. And about the CPHA, it does select when the the data needs to be sampled, and is correctly explained in the post. When is set to 0, it samples at the leading edge, and when set to 1, it samples at the trailing edge. Check your resources maybe? i am used above code but nothing show on LCD…any body help? Are you sure you interfaced the LCD properly? Refer to the LCD tutorial to know more. Is there any possibility of communicating with xbee module via android smartphone…?